Throughout the weekend and public holidays and between 18:30 and 08:00 on weekdays our phone lines automatically divert all calls to our out of hours' provider GP Collaborative. If you require urgent medical attention that cannot wait until the surgery opens please call 111. This is a free call from landlines and mobiles. 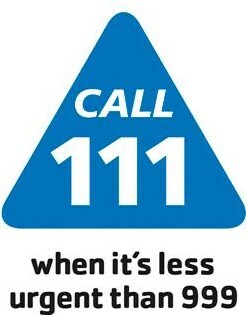 If you have a life threatening emergency dial 999. The nurse-led Minor Injuries Unit treats most minor injuries such as cuts and bruises, minor burns, fractures to the hands and lower arms, lower legs and feet. The Unit cannot treat injuries to the chest, back, hips or thighs. Accessing service - Walk in service, Royal Hallamshire Hospital: 08:00 to 20:00. Typical procedures – you may be required to undergo a number of tests such as X-rays, blood tests, etc. This will depend on your symptoms and will be decided by the nurse in charge of your treatment. Please note: There is NO accident and emergency department at the Royal Hallamshire Hospital.